Heat oven to 350°F (325°F for dark or nonstick pan). Grease or spray bottom only of 13x9-inch pan. In large bowl, mix cake mix, butter, egg and milk with spoon until dough forms. Stir in peanut butter chips. Spread evenly in pan. Bake 16 to 18 minutes or until toothpick inserted 2 inches from side of pan comes out clean. Cool completely, about 1 hour. 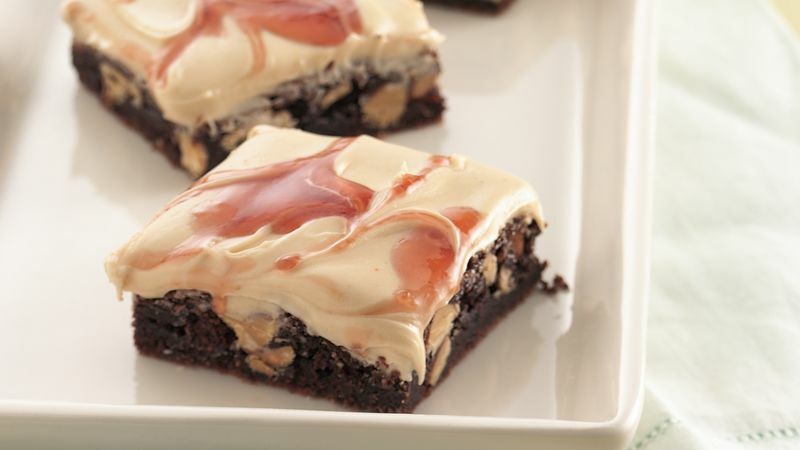 In medium bowl, stir frosting, peanut butter and milk until well blended; spread over brownies. In small bowl, place jelly; stir until smooth. Drop small teaspoonfuls of jelly evenly over frosting. Swirl jelly with tip of knife for marbled design. For bars, cut into 6 rows by 4 rows. Store covered in refrigerator. Use chocolate instead of peanut butter chips if you like. For smooth swirling, stir the jelly before dropping it onto the frosting. Feel free to use whichever jelly you have on hand in place of strawberry.